If you want some great running shoes then check out these women’s Nike free running shoes as they are made to make running more natural. 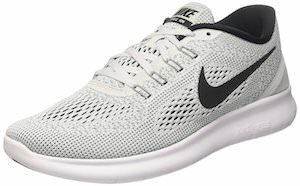 You can get these Nike running shoes in many cool colors like the black and white woven once we show above but also in blue, pink, green, orange, black, and much more. And you can get these running shoes in many women’s sizes going from 5 – 12 and half sizes are available to so that you can get running shoes that fit perfectly as you don’t want to run with blisters because the shoe didn’t fit.